Specialty Chemicals Market size was valued over USD 830 billion in 2015 and is forecast to experience gains exceeding 4% CAGR by 2024. Global population was roughly 6.89 billion in 2010 and reached more than 7 billion in 2015. On the other hand, the global arable land area was around 1.37 billion in 2010 and surpasses hectares to 1.42 billion hectares in 2015. Which indicates that the global population inclined by 4.9% and the global arable land witnessed 3.4% growth during the period. Rapid population expansion has elevated food security concerns in underdeveloped and developing countries due to improper storage infrastructure and food grains distribution. This as a result, leads to increasing high yield-enhancing agrochemicals demand owing to propel specialty chemicals market share over the forecast timeframe. According to the World Bank, farmers may have to upscale their yield by 50% per hectare by 2050 owing to boost agrochemicals, such as fungicides, demand by 2024. The automotive industry is one of the most lucrative industries for the specialty chemicals market share. These are used as polymers & plastic additives, paints & coatings and adhesives & sealants in the automotive. China, Japan, India, South Korea and the U.S. lead the global automotive sector by accounting over 55% of production global cars and commercial vehicles production in 2015. Increasing middle-class population and increasing automotive appeal have prompted car manufacturers such as Audi AG, Mercedes Benz and BMW AG in America and Europe to enter Asia with small cars that are especially designed to meet requirements in Asian automotive industry. Furthermore, global personal & commercial vehicles production in 2015 was roughly around 90 million. This consequently will drive specialty chemicals market size owing to its widespread application across automobiles. In addition, lubricants use in the automobiles to maintain engine smoothness will further complement industry growth. Majority of specialty chemicals are synthetic which may have adverse effects on the environment, thus affecting flora and fauna. 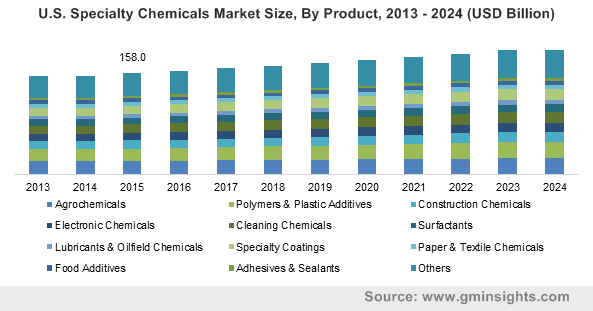 Therefore, environmental protection agencies have imposed various environmental regulations on the synthetic chemicals usage due to their toxic nature, which may hinder specialty chemicals market size over the forecast timeframe. For instance, the European Union has banned atrazine and acetochlor herbicides. Also, in June 2015, France and Denmark banned glyphosate for usage in lawns and gardens. Declining coated paper trend in North America and Europe may obstruct paper & textiles specialty chemicals growth in the next few years. Media digitalization is impacting the industry growth for paper chemicals. Traditional marketing products such as catalogues and pamphlets are experiencing sluggish demand due to digitalization of promotional activities across the Internet through websites such as Facebook, YouTube and Twitter. However, increasing construction spending in BRIC nations is positively influencing construction specialty chemicals market size and has created new business growth opportunities. Construction specialty chemicals market size was valued at over 70 billion in 2015. These are used in buildings and other construction structures to increase their shelf life. They also provide protection from environmental hazards. These chemicals impart several properties that help meet the aesthetic, functional and design requirements of civil structures. These include a wide products range such as asphalt additives, concrete admixtures, adhesives, sealants and protective coatings. Electronic specialty chemicals market share shall witness gains exceeding 4.5%. These are utilized in electronic components in applications such as semiconductors and integrated circuits. Furthermore, increasing smartphones demand will positively influenced the industry growth by 2024. Food additives specialty chemicals market size is analyzed to witness inclining growth. They are used to enhance the foods nutrient content, keep the product fresh and make the food more appealing. Furthermore, it also provides consistent and smooth texture along with maintaining the wholesomeness of food. Increasing living standards accompanied with rising consumer’s disposable income would drive growth for food additives in the next few years. North America, led by the U.S specialty chemicals market size generated revenue more than USD 200 billion in 2015. The regional growth is primarily driven by increasing lubricants & oilfield chemicals demand owing to increasing oil exploration in the U.S.
Asia Pacific was the dominant industry share contributor in 2015 and is forecast to witness highest growth more the 6.5% CAGR over the forecast timeframe. High construction spending in China, India and Japan has driven construction chemicals market share in the region. Furthermore, increasing automotive sector in the region on account of high per capita disposable income along with improved lifestyle of consumer is the main factor propelling business growth. Global specialty chemicals market share is highly fragmented owing to numerous industry players contributing to the global share. The top five producers operating in the global specialty chemicals market include BASF SE, The Dow Chemical Company, Bayer AG, DuPont, and INEOS Group AG. Other industry share contributors are Ashland Inc., Clariant AG, Huntsman Corporation, Arkema S.A., Evonik Industries AG, Chevron Philips Chemical Company, Syngenta AG, Albemarle Corporation, Chemtura Corporation, Eastman Chemical Company, Solvay, and Akzo Nobel N.V. Product distribution channels comprises of wholesalers, sales offices, regional resellers and online portals. However, most manufacturing companies operating in the specialty chemicals market supply their products to clients through their own distribution channels. For instance, Evonik Industries AG has distribution agreements with Univar Inc. and Glenn Corporation for selling cosmetic chemicals. Akzo Nobel N.V. has an agreement with Essential Ingredients Inc. for distribution of cosmetic chemicals. Furthermore, Chevron Philips Chemical Company has partnered with Quadra Chemicals to distribute its mining chemicals in Canada. Global specialty chemicals market size is chiefly driven by increasing end user industries including automotive and construction mainly due to upgrading end user lifestyle in Asia Pacific and Latin America. However, increasing bio-based chemicals demand owing to environmental hazards caused by synthetic chemicals may hamper industry growth over the forecast timeframe. Presence of stringent environmental regulations, especially in developed regions, is boosting the end-user industry’s shift toward preference for bio-based chemicals.